On Monday, I went along to the London Beauty Blogger Meet, organised by Sophia from Tattooed Tea Lady. I was so excited to get to chat with some familiar faces, and also get to finally say hello to some people I've been talking to on Twitter for ages. Alice, Charl, Charlotte, Gemma, Hannah and I met up beforehand for a catch up session and a cheeky trip to Meat Liquor before we headed off to meet everyone else at Selfridges. At Selfridges there were so many beauty bloggers! It was great saying hello to everyone, although I don't think we all got chance to have a good natter. 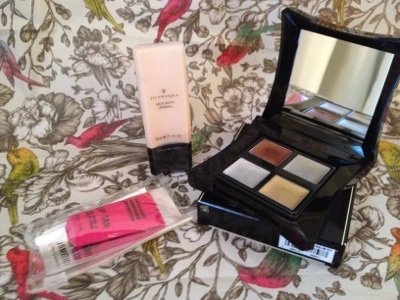 We went into do a bit of shopping and I indulged on my first ever Illamasqua purchases. I bought the Skin Base foundation and also the quad liquid metal palette as i'd been eyeing it up for weeks. I also took a leap and pick out my first ever OCC lip tar in a hot pink shade. After Selfridges, 30 of us were whisked off to the She Said Beauty headquarters They'd kindly laid on drinks and what seemed like an endless supply of mini cupcakes (I may have had more than one...). Illamasqua, HD Brows, Filthy Gorgeous nails and Millie Mackintosh lashes were all there to give us demos and I was really excited to try out the Illamasqua speckled liner look. We were all given a goody bag on the way out featuring all of the brands there from the evening, plus a Birchbox and some She Said Beauty goodies. As I was staying overnight in London with my Meat Liquor ladies, we decided the next day to pop to a few shops and make the most of our day there. 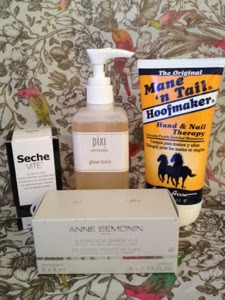 I had a Liberty reward voucher to use up, so decided to get the Seche Vite quick dry top coat, plus also try the Hoofmaker hand cream. I also was lucky enough to get hold of a loyalty freebie from Anne Semonin, which was a little packet of freezable eye masks (more on these in another post). The last purchase of the day was from the Pixi store in Carnaby Street. Alice had been raving about their glow tonic toner after seeing a glowing recommendation from Caroline Hirons and that was enough for us both to buy a bottle! After all these purchases, we decided it would be a good idea to refresh ourselves over a Primrose Bakery cupcake. Yum! I went home laden down with products, a very happy, but tired girl. This is my last haul post for a while as I'm starting my spending ban, so let me know what you're favourite item is!